Traditionally, teaching vocabulary often involves pre-teaching lists of words, copying down definitions from the board, and children spending endless hours looking up definitions from dictionaries. A vocabulary gap exists among students in different socioeconomic groups. Vocabulary knowledge affects long-term student achievement. Vocabulary growth accumulates over time. We should not wait to teach children words. This statement holds especially true for children from working class or poverty stricken homes. On average, these children hear 50-75% less words than children from a higher socioeconomic status. Their limited exposure to words results in vocabulary sizes that are half that of their same aged peers. Having students become word sleuths, finding words they want to learn, or discussing new word meanings and use. Vocabulary is an extremely broad topic and Katie and I both support this shift in thinking. In addition, it is also important for parents, teachers and speech-language pathologists to teach relational vocabulary as much or more than referential vocabulary. Referential Vocabulary - The understanding of what a specific word refers to. For example, knowing the word "chair" refers to the four legged object we sit on during dinner. Obviously, it is important that children understand and use a large number of words. Relational Vocabulary - Refers to a person's ability to understand relationships between words that share a variety of functional and conceptual relationships. For example, knowing the words "envelope" and "stamp" share a functional relationship in addition to simply knowing what objects the words "envelope" and "stamp" refer to. 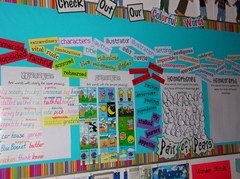 Teaching antonyms, synonyms, categories, classification, and figurative language are just some of the ways to build relational vocabulary knowledge and support reading development. Be sure to visit the Free Vocabulary Activities Page for great resources for teaching vocabulary.